Analyze tool is designed to give you a quick overview of the component. It is designed to highlight the most important parameters of the component at a glance. Analyze tool displays the part components extent dimensions, also called bounding box dimensions. Glovius picks up the accurate dimensions even if the component is designed at an inclination to the default planes. 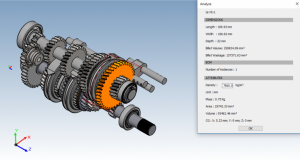 Analyze tool calculates the volume of the component along with the billet volume. This aids in the calculation of the billet wastage in case the component is manufactured by milling etc. Analyze tool gives you the mass of the component. In case the original file doesn’t have material properties assigned, you can edit the density values to calculate the mass of the component. Section tool helps you see the internals of the component. 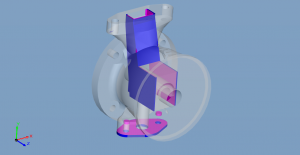 Using the various options in Section tool, you can identify the internal geometry features. 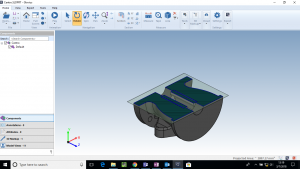 Apart from taking sections along standard planes, you can use the reference planes in the component or create custom planes for sectioning along a specific plane. Measure tool is our most used and versatile tool. Using the Measure tool, you can check the feature definitions – the length of an edge, the diameter of a hole, the width of a rib, and more. Glovius assists users in measurements by highlighting the suitable geometric entities (points, edges, planes) to enable users to measure faster. We also have specific measure tools called Tape Measure and Area measure – the tape measure can be used to calculate the total length of a complex edge or spline or the length of a complex curve. The Area measure tool is used to calculate the area of planar and non-planar surfaces. Read more about all the capabilities of measure tool here. 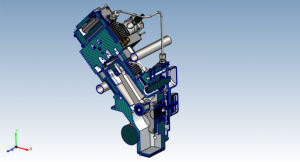 The design of a part evolves through various iterations during the design to manufacturing process. Compare tool helps you to identify the changes to the features of the component. Input the two versions of files to Glovius and visual the changes (and their similarities) in 3D. Glovius identifies the changes to geometry like change in the fillet radius or addition/removal of a stiffener rib. You can export a PDF report of this result and share it with your team and suppliers. The thickness analysis tool analyzes the material distribution in the part design and displays the results visually. Using this tool, you can check the values of all the dimensions in the component alongwith the thick and thin regions. 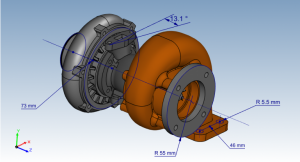 Identifying the thick and thin regions helps you in optimizing the part design. Thin regions may fail during usage and thick regions increase material costs. Read more about this tool here. Projected area is an indispensable tool to calculate the area at a particular plane. If the part is being cast, use this tool to calculate the casting pressure. The applications of this tool are varied. For example, you can use the area value from this tool to calculate the drag coeffients of the part if it is intended to be used in a fluid environment. 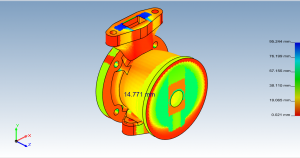 Draft analysis is an indispensable tool if your component is manufactured via Casting or Injection molding. 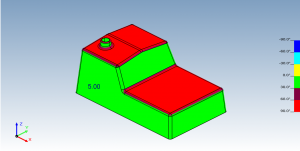 Using this tool, you can calculate the drafts made by all surfaces of the components with respect to a reference plane. The results are displayed in 3D with colorized surfaces to categorize and identify the surfaces based on the draft angle values.